Love or Money, shelved since 1988, is the kind of painfully laugh less romantic comedy that was made more frequently when investors looking for major losses could use films as tax shelters. If only for diminishing the number of lousy movies made with sheltered money, the Tax Reform Act of 1986 was good for something. 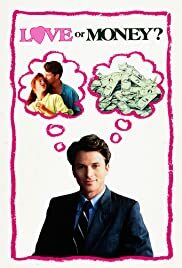 Love or Money, the story of a young, handsome, poor, unprincipled real estate broker who falls for a young, beautiful, rich, principled marine biologist, manages to be heartless and bankrupt. This movie is not about love or money. It is about upwardly mobile white kids who summer in the Hamptons, where they drink umbrella cocktails called ''Frontal Lobotomies" that are mixed with Midori, champagne, Paul Masson Chardonnay and Robitussin. After their libations, they flirt, play tennis and make baby-talk business deals. The fact that the characters drink Frontal Lobotomies perhaps explains the brainlessness of the script. It took three screenwriters to write dialog on the order of "What's wrong with making money? It's a creative thing!" It took the same three people to come up with this original story idea: Money-mad boy meets Eco-sane girl; money-mad boy loses Eco-sane girl; money-mad boy gets Eco-sane girl. Like the moral of so many Hollywood movies, they don't have to choose between love and money. Without working too hard, they get bundles of both. Charmlessly directed by former production designer Todd Hallowell, the movie has zero coherence and negative style. The film is so amateurish that it could be mistaken for a student movie. Credit Hallowell (or his casting director), however, for hiring some amiable stage actors, such as Timothy Daly as the romantic lead and convivial pro Kevin McCarthy as the father of his beloved. Shelley Fabares, Donna Reed's television daughter, who had a hit with ''Johnny Angel," looks terrific in the role of McCarthy's flirty wife. She also looks as though she's in need of a Frontal Lobotomy to get her through. If you go, take along a shaker of 'em.